To satisfy our needs we page through these sketches, if only they were refined, enhanced and enlarged! What will then be lusciously shown? In which tunnel do we hold our breath? In which waiting room do we hold our mouth? In which compartment do we hold our peace? The internet is searched for photos of people with a ‘beautiful flaw’. Large and small, thick or skinny, black or white but never put down, always self-conscious, vibrant personalities. Through background, education and experience the artist acquired a help-modus which was either repressed or forcefully erupted during different phases of life. He acknowledges the injuries of the flawed human and takes him out of obscurity onto his paper sheets on the ground floor of heart and studio. The result is healing art given free rein, large nudes drawn in pencil or charcoal. Figuratively and appealing, yet set in an alien scene. With some, the background is empty, the figures floating without any anchor in space. Kept within the bound of the paper a leg or head disappears. Content is symbolic, magic, surrealistic, assisted by mythical emblems like apple, snake or bird. Confrontations are not shied away from, life-size images occupy the whole surface, look at us and come close. But they also nudge us to take our distance to get an overview. The monumental quality invites movement. You literally walk towards and away from them, pass them as in a comic book, cartoon, stop, tango, go! These conscious movements are also reflected in the statues. In them the tension is diverted by a commonplace subject; the animal, domestic cat, frog. The disorienting effect of so large a clay cat is felt when it slumps, it seems to be made of wax; evoking indulgent listlessness. From anecdote to myth, Honoré dares to eclectically seek for deep compassion and new truths through intuition. The pieta’s divine mother is replaced by a female Buddha with undeniable African traits. Disengagement by loss and sorrow is enhanced by the floating carpet resting on four corners. It is not just the child that is dying, the mother is too. Her attention turned inwards, she fades. The sorrow of the world is timeless, the human condition unfathomable and the personal will always remain political. This image with universal power clenches all beyond the personal. Which church in Roermond will open its doors to welcome this present day power icon that cries out for dire empathy? Exactly amidst the Limburg area there are chances to show ripe, original art from Christian vines. Sculptures and images reflecting cultural layers and diversity reflect the old city by the Maas river. 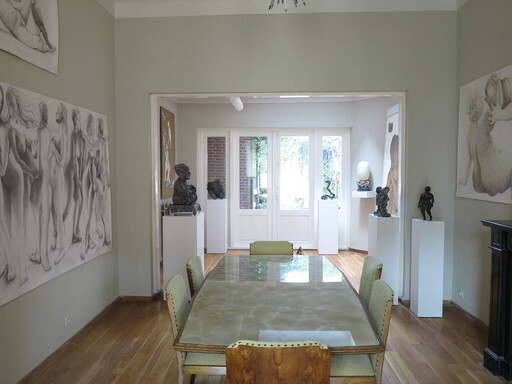 But you can also visit the artist’s home, his warm house will welcome you! An experience to cherish!